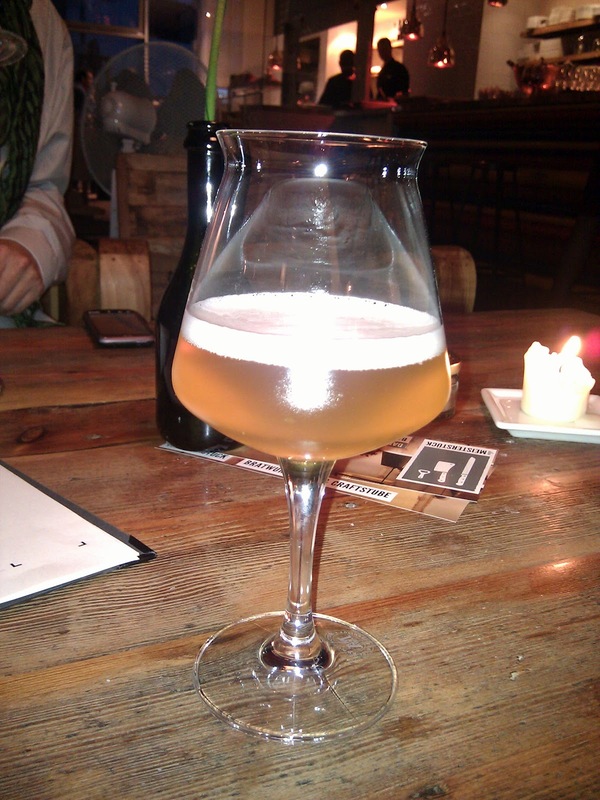 Churchyard Brewery: Wo bist du, Berliner Weisse? Wo bist du, Berliner Weisse? "Enjoy lots of Berliner Weisse!" "In front of everyone stood a gigantic tumbler which could have been fitted with ease upon any ordinary head, and which contained a liquid pale and clear as Rhine wine, surmounted by a huge crown of froth not unlike a prize cauliflower. This was he famous 'weiss,' the mere mention of which suffices to send a Berliner into raptures and into the mysteries of which I was about to be initiated... [The beer] should be largely impregnated with carbonic acid gas and have acquired a peculiar sharp, dry, and by no means disagreeable flavor." Like many other sour beers, Berliner Weisse is becoming increasingly popular in the United State. Most fans of the style have likely tried Dr. Fritz Briem's version, brewed at Weihenstephan in Germany and based off a traditional recipe from 1809. (This was, in fact, the beer that introduced me to the style.) But there are also dozens of American breweries trying their hands at the style, ranging from traditional versions like that found at Southampton Publick House to more experimental versions like the Somer Weisse from Night Shift. In fact, a glance at the list of the top Berliner Weisses at Beer Advocate reveals only 10% of the beers are made in Germany, while 82% come from the United States. Like many traditional German styles, the Germans just baren't brewing them anymore. As of June 1st there was only one brewery in the city brewing a Berliner Weisse, this being the macrobrew Berliner Kindl Weisse. It is not a terribly difficult beer to find, though if you were to see it on the street, you'd likely have no idea you were looking at a beer. In modern-day Berlin, the Berliner Weisse is served "rot oder grün." In other words, with red (raspberry) or green (woodruff) syrup. And it's served with a straw. In a bowl (or occasionally the goblet pictured right). Since 2006, Berliner Kindl Weisse has been flash pasturized and is no longer bottle conditioned. The beer pours a pale, slightly cloudy gold and has a tart, lemony sourness to it. Very little finish, the beer is certainly refreshing, though honestly I wasn't terribly excited by it either. But apparently I picked the right time to come to Berlin, because last week I had the opportunity to try two new additional Berliner Weisse's that are unique to Berlin. The first was from Brewbaker, the Berlin micro-brewery I wrote in great length about in my last post. Released on July 1st, the beer – which I tasted at the brewery – had a refreshing, almost musty character with lots of carbonation but a quickly fading head. Lots of lemon flavor, it was sour but not mouth-puckering and tremendously refreshing. I was fairly certain that these would be the only two Weisses I would have the fortune to taste while in Berlin. But again, I was surprised when I walked into Das Meisterstück: Berlin's only Craft Beer Bar (more on this in an upcoming post). In their cooler was an unmarked bottle which was described to me as a Weisse brewed by a Mr. Marshall (an American) at Brauwesen – the local brewing school at the Berlin Technical Institute. And this beer might just be the best Weisse I've ever had. Though tremendously sour (easily the most sour of the three), it was tremendously drinkable, light in body but in no way watery. There was a lemon character that was balanced with a light hops, as well as a hint of salt and a slight smokiness that lent it a depth the other beers just didn't have. This wasn't a far-fetched idea either: until 1860, the brewers of Berliner Weisse brewed the beer with smoked wheat malt. But unlike the Smoked Berliner Weisse from Freigeist Bier Kultur, the smokiness was very much in the background, and really just served to give the beer a little deeper dimension. I am in Darmstadt for the next couple weeks, but when I return to berlin in August, I hope to learn more about Brauwesen and Mr. Marshall: though just a student, he might already be among Berlin's best brewers. "Wo bist du, Berliner Weisse? Where have you gone?" "Ich bin hier, Keith! In Berlin! Right where I should be!" Brewbaker's Berliner Weisse was good, but Bayerischer Bahnhof's is better. Too bad you can't but it in Germany though (only for export). I continue to be frustrated that many of my favorite German beers aren't available in Germany!